Good dental hygiene is a crucial part of maintaining your pet’s overall health. Although pets don’t tend to get cavities, they are at risk for other dental issues such as periodontal or gum disease, making it the number one ailment found in both cats and dogs. Therefore, it is essential for pet owners to include dental care in their animal’s veterinary routine. Without proper treatment, conditions such as periodontal disease can lead to painful chewing, bad breath, and tooth loss, compromising your pet’s health and quality of life. To keep your pet healthy and smiling, the Animal Medical Center of Streetsboro is celebrating Pet Dental Health month throughout January and February, making it the perfect time to take advantage of our dental services and improve your pet’s dental health. 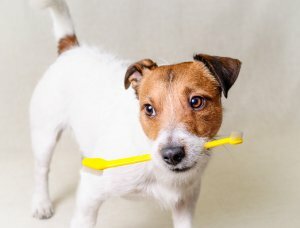 How Can I Tell if my Pet Needs Dental Care? With our professional dental cleaning and other dental services, we can remove the visible tartar and plaque while also eliminating the bacteria under the gums. Regular dental cleanings and proactive care will keep your pet’s mouth clean, eliminating potential sources of infection in the mouth or throughout the body while also helping to prevent tooth loss and pain that comes from untreated dental conditions. Take advantage of our special offer for Pet Dental Health Month by scheduling your appointment today!